“I love to cook with wine, sometimes I add it to the food.” This quote is often attributed to WC Fields. But I really think I thought of it myself before I ever heard it. Anyway, it is so true. I love to cook with wine. I love to sip wine while I cook. I love to add wine to my dishes. The other thing I love is all the fresh vegetables that are available this time of year. 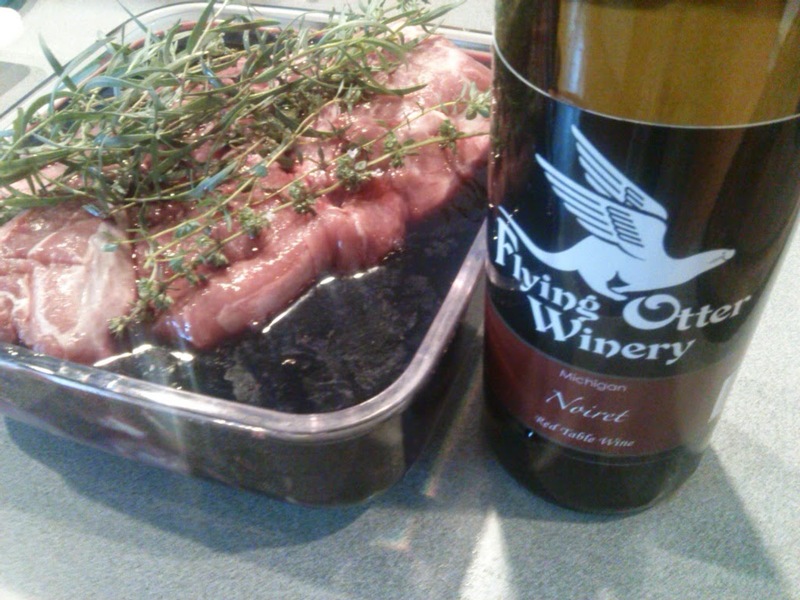 Oh, and one more thing I love – Flying Otter Winery Noiret. I often tell people when we offer tastings of Noiret that I wish they could taste it with food. It makes such a great red table wine. Here is something I did recently to feature all of these – cooking with wine, Noiret, and fresh vegetables. Place the pork roast, herbs, and a whole bottle of wine in marinading container. I like to use a container that came with our vacuum sealer. Allow the roast to marinade in the refrigerator over night. Place the whole thing including the marinade into a brazing pan. Cook covered for ~4 hours @ 275-300. Check it occasionaly to make sure you don’t run out of liquid and the pork reaches the desired tenderness. Like I said earlier, I love all the fresh vegetables available in the summer. But if you are anything like we are the refrigerator starts to fill up faster than you can eat them. Here is something I like to make that can use whatever vegetables are filling your frig. 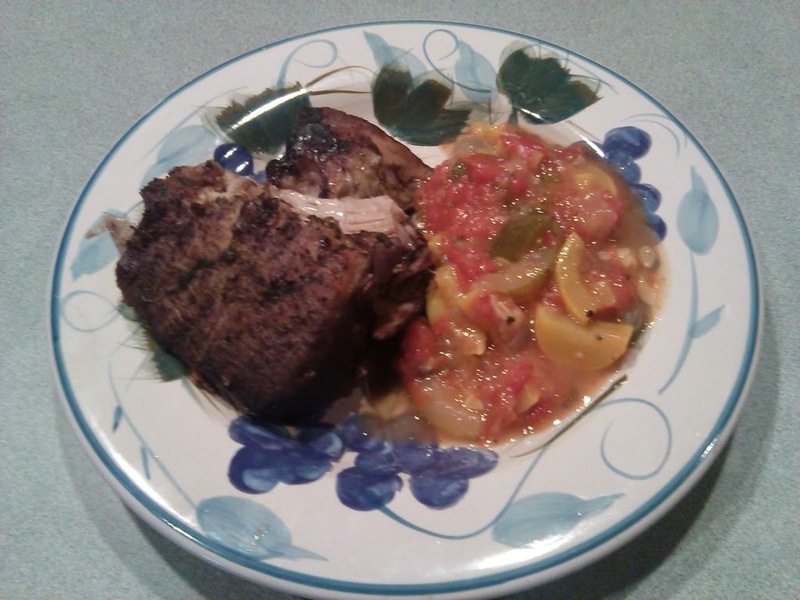 I call it Ratatouille, though I doubt that it qualifies as the real French provincial dish. Start by chopping up whatever vegetables you have in the frig that you are wanting to use up. The basics include onions, peppers, garlic, summer squash, tomatoes, eggplant, etc. The recommended French method is to cook each vegetable individually to the desired doneness and then add them together at the end so thay are all cooked to the proper level. This method uses way too many bowls and pans, and takes too much extra effort. A more common alternative is to add the individual vegetables to a stove top pot in order based on cooking time, waiting 5-10 minutes between each addition. Again, for me this requires too much time and effort. The method I like to use is the one pot brazing method. It is true that some of the more tender vegetables that require less cooking time will disappear and just become part of the sauce. But what a wonderful, flavorful sauce it is! Cook covered ~ 1.5-2 hours at 300 degrees, stirring occasionally to reach desired tenderness level and make sure you don’t run out of liquid. This is even better after the flavors meld overnight in the refrigerator. Just reheat and serve.